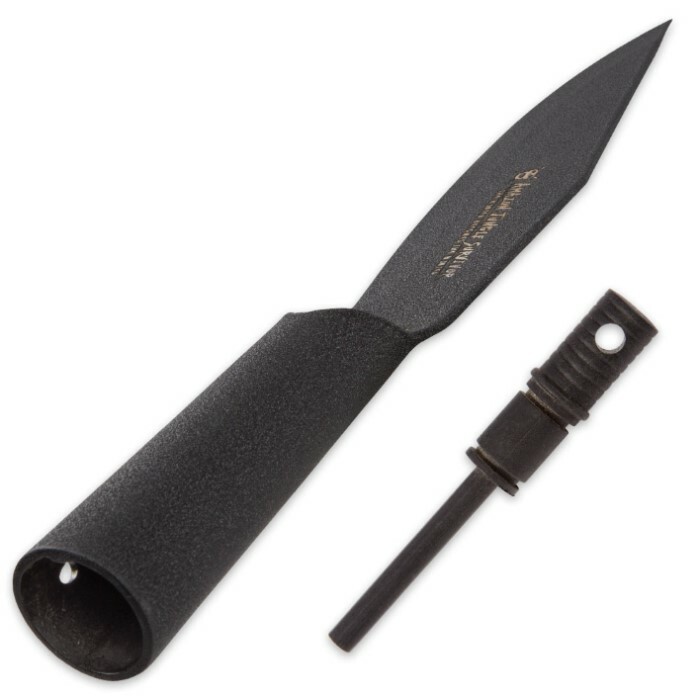 Amazon Jungle Survivor Spearhead with Fire Starter and Nylon Sheath - 1045 High Carbon Steel | BUDK.com - Knives & Swords At The Lowest Prices! Firearms may malfunction and fail, ammo supplies may run dry and even arrows are easy to lose and break, but for millennia the mighty spear has proven to be the most reliable weapon of them all - outlasting ice ages, extinction events, mass migrations and culture clashes, and every other cataclysm since the dawn of man. Primitive but potent, the Amazon Jungle Survivor Spearhead builds on this unprecedented success, fusing a time-tested prehistoric design with ultramodern materials and forging techniques. The result is a weapon with unequaled dependability that's even more capable and deadly than its stone, bronze and iron forebears. 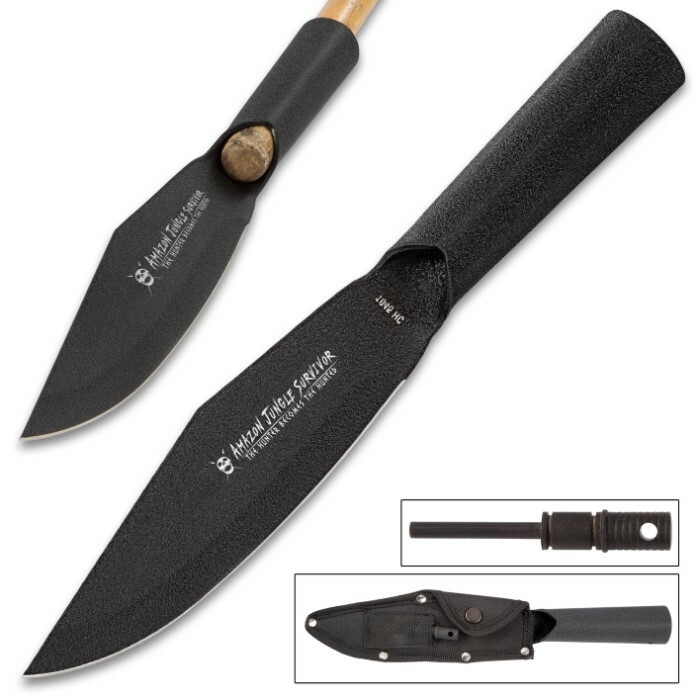 Forged from extraordinarily tough 1045 high carbon steel, the Amazon Jungle Survivor Spearhead features a razor sharp 7 1/2" blade with a versatile profile and resilient, carefully honed single edge. 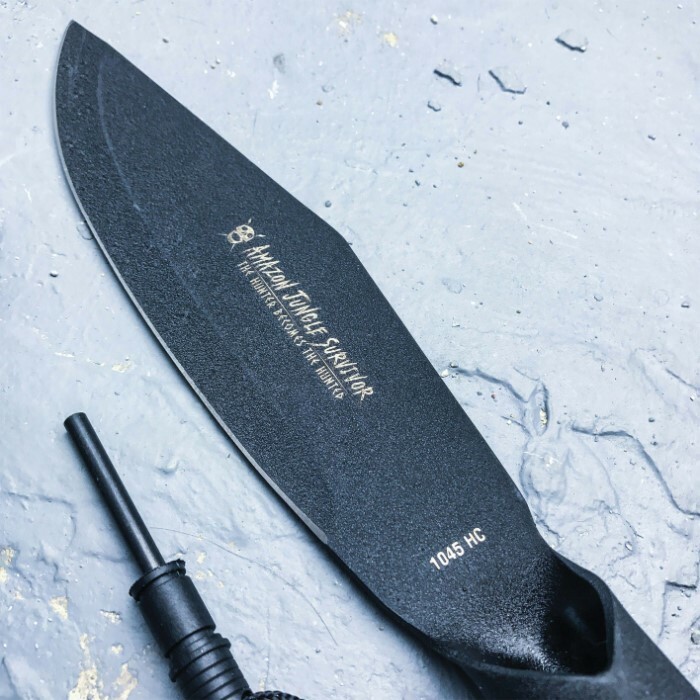 "Amazon Jungle Survivor: The Hunter Becomes the Hunted" is stamped in the center of the blade in white, beautifully offsetting the rustic black hue of the steel. The neck is fashioned from the same single piece of high carbon steel as the blade, yielding maximum strength and a rock-solid bond with any suitable spear pole. It's easy to wed the Amazon Jungle Survivor Spearhead to a wooden stick, dowel or practically any appropriately sized pole made of almost any material, thanks to the sturdy neck's tapered form and integrated fastener hole. 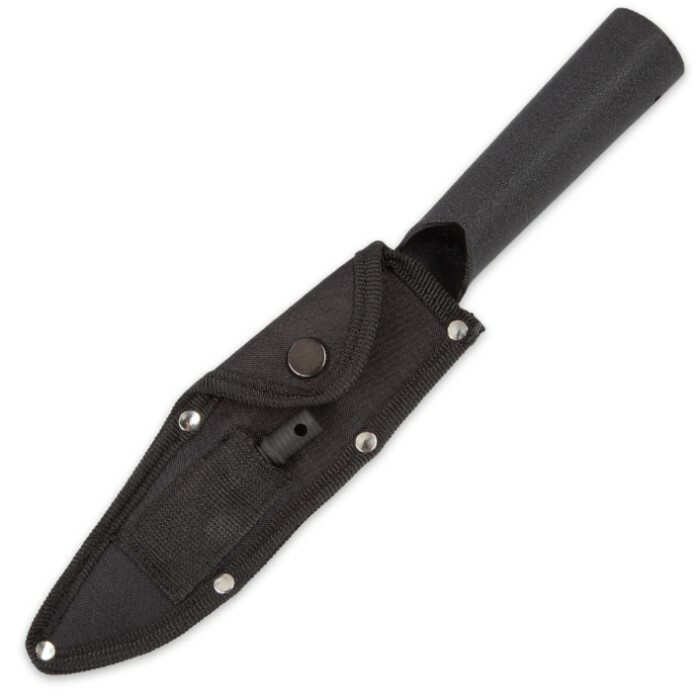 The included heavy duty nylon snap sheath allows for convenient transport and storage, while providing ample protection from the elements. A handy fire starter rod is tucked away in the sheath's outer pocket. 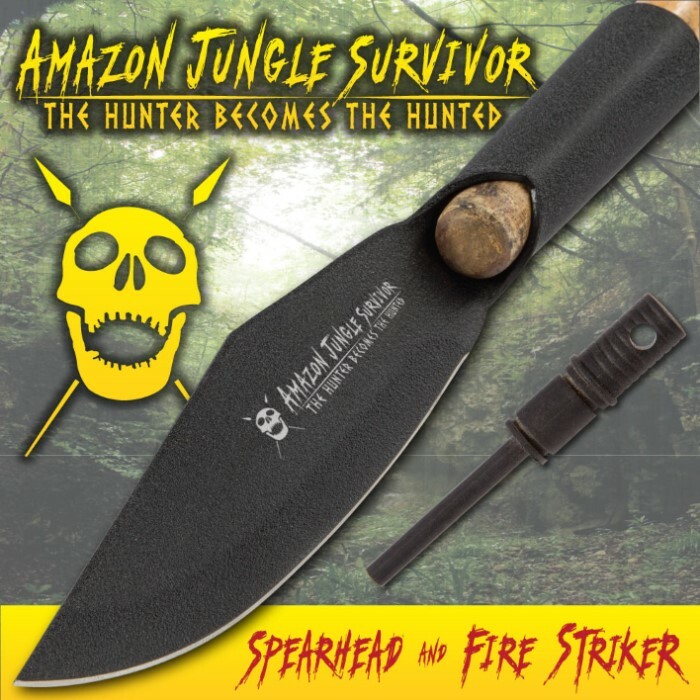 When other weapons fail, the Amazon Jungle Survivor Spearhead will always remain an effective hunting tool and source of protection. No outdoor gear, arsenal or supply cache is complete without one - it's truly a must-have for survivalists, preppers, outdoorsmen, primitive weapons enthusiasts or anyone who simply appreciates fine craftsmanship and classic design. Not bad,but not great . Overall it could be a little thicker near the tip. I bent the tip while throwing it into a pine board. I Reworked the tip with a angle grinder and it seems to work well. Sharpening is a decent. The rod that it comes with is okay , might want to carry some tinder with you if you plan on it being your everyday carry. The sheath holds it ,however it's a little awkward on the belt . However the blade is pretty flexible and it can bend a considering distance. Overall it's worth the money, but you will have to give it a little TLC it should work well as a backup . Good knife. Fits perfectly to the 1 - 1/8-inch DOWEL ROD that I bought from Lowes. The fire striker feature is not so good. It would not strike . Another bargain from BUDK! I received this in 2 business days, the week before Christmas when shipping slows down due to high volume, which I find to be amazing. The Amazon Jungle Survivor has passed my torture testing which lasted for 2 days and included mounting it to a spear shaft and throwing it full force into a seasoned dead trunk of a hackberry tree, batoning seasoned red oak, attaching a 2 foot length of stick and using this knife as a machete, feather sticking, and other cutting tasks including slicing bread and peeling potatoes. 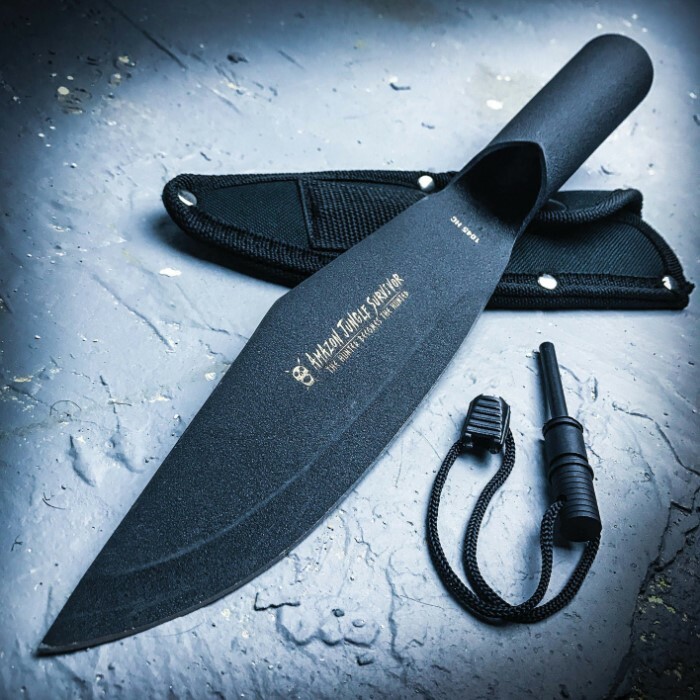 This will be my new big knife in my hiking, camping, and survival gear and will be replacing a long carried USMC Camillus, a great knife itself but not as versatile as the AJS. I recommend the AJS wholeheartedly and at a price point that is unbeatable in the big knife category. Check my knife torture test on the AJS out on YT under Wildcat Creek Survival. I like this spear knife. Its heavy duty, seems to have some flexibility in the blade, so no snapping. This would work as a survival tool or a self defense tool depending on the circumstances. The two bad things are that it has this coating on it and the spine or top of the blade is not square so the ferro rod will not work. You have to take a file and square it off, taking off the coating in the process. The last bad thing is the sheath. It does not go up the handle so the belt loops are way down and it is awkward on a belt. The belt loops are kind of weak on it to begin with it. One way to overcome it is to put a MOLLE Kbar adapter on it and mount it to a pack. I am thinking about getting a sheath made for it. I was pleased with it. The only thing I didn't like is it is terribly dull. I have sharper butter knives. slick design, great blade length, relatively sharp, minimal taper to fit stick which makes fitting much easier than a sharp taper, over all great design at a bargain price. I mounted this spear to a five foot long x 1 inch & 1/4 diameter tapered shovel handle. It fits perfectly. I can't wait to use this for boar hunting. It came sharp from the box, but I used a honing rod to bring it to razor sharpness because when spear hunting bore you better be ready. I have no doubt that this spear will do the job. As for all the people that complain about Bud K all I have to say is that they need to stop abusing the knives. When you understand that different knives are made for different purposes they will last you a lot longer. I mean you wouldn't use a butter knife to cut steak, would you? My point is some knives are meant for chopping, some for slicing, & some do both. Understanding the basic use of knives will save you from breaking them. As for those who choose to use them to beat or pry on stuff a bit of advise. Get a hammer or crowbar. Got this one out of my mystery box I recently order along with the M48 Combat Toothpick. With the addition of the ferro rod, this is a great knife. I haven't had the chance yet to get it out into the woods to test it but I'm very happy with the construction. The spine should be ground to a better 90 degree angle to spark the ferro rod as mine won't. But I'm not to worried about that fact as I have several other knives that will do so just fine. The fact that I can turn it into a spearhead just by jamming it onto a staff gives it that extra plus I was looking for in a bush blade. This is going into my bug out bag with the rest of my heavy duty survival gear. I've heard a lot of bad YouTube reviews about BudK products but I can't see why. Everything I got in my mystery box was great quality and what I was hoping for. Awesome job BudK, you have gotten yourself a return customer. I ordered two - one was perfect and the second I'm sending back because the blade is bent. Judging by all the excellent reviews, I guess I was just unlucky to get a factory reject. Oh well, I'm looking forward to receiving its replacement. I'm a big fan of the spearheads available from this site - I wish the Columbian spear was cheaper than $29.99. I'd add that one to my collection too if it was the same price as this Amazon.